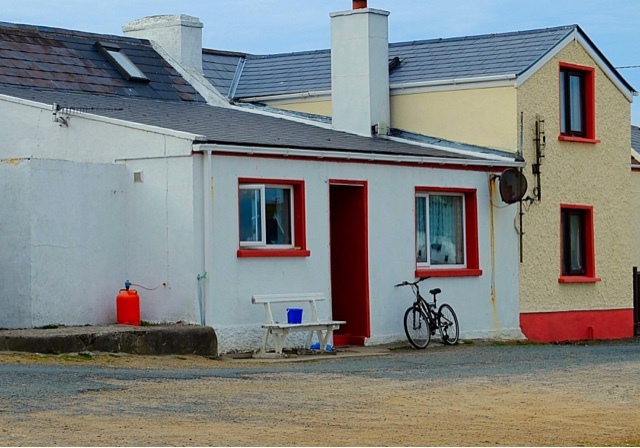 “Ireland’s Islands are very romantical, they are”. This is from The King of Tory Island, who is showing us the art gallery and doing a wee bit of flirting in the process. And yes, he is a real king. And with his captain’s hat and gold hoop earring and penchant for telling stories and easy laugh, he is the perfect ambassador for this tiny Island that desperately wants more visitors to come across the rough channel. 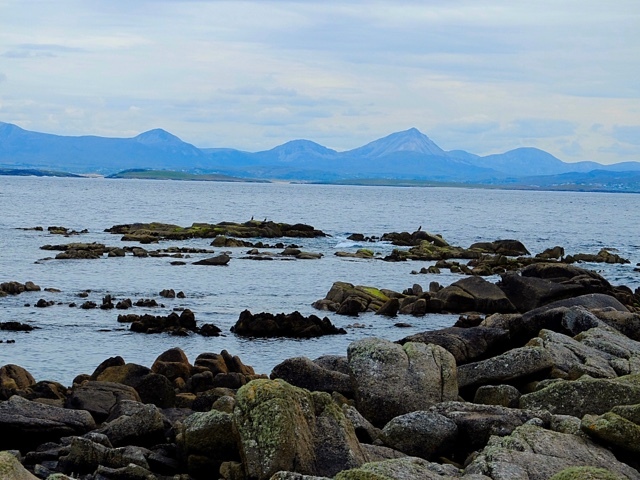 Tiny Tory Island, on the very northern tip of Ireland, within squinting view of the Scottish Isles on a clear day, has been electing a king for the past 1400 years. This was a tradition of many islands in Ireland … Tory is the last. He is referred to by everyone on the island simply as “The King”. He refers to the island as “my island”. 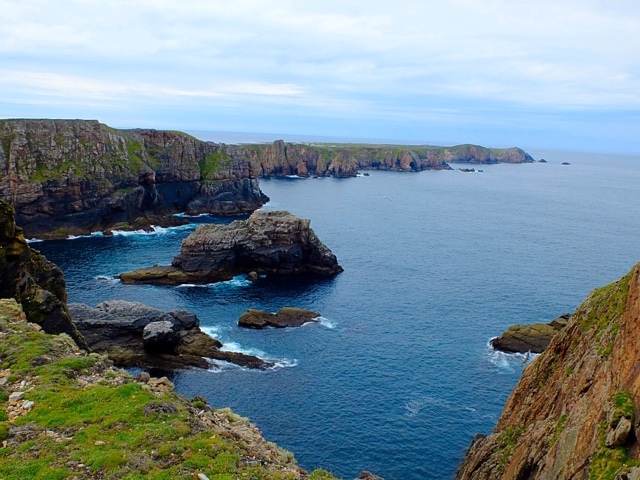 The cliffs are full of nesting birds, and the waters have hundreds of birds and dozens of species flying and fishing below. 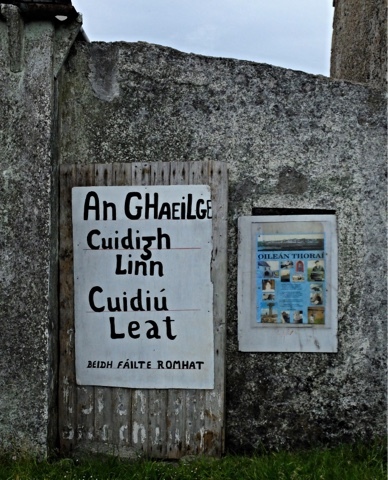 Besides having the last Irish King, Tory Island is also one of the few places where locals all still speak in the pure Irish Gaelic, and the culture and traditions remain truer here than most other places. This is because the Island has been so isolated from the mainland for so many years. And also because they have a healthy history of smuggling and contraband whisky making and other nefarious activities that encouraged keeping a healthy separation from modernity. The population of around 200 live in two tiny villages – clusters of white houses with red trimmed windows and doors circled against the winter wind and weather. Remains of a 1200 year old monastery and its tumbling bell tower still sit in the middle of the village. Boats are pulled up on shore … there is very little fishing any longer here and no income from the sea. People still gather in the bar at the hotel for music in the traditional way … someone shows up to play if they feel like it. 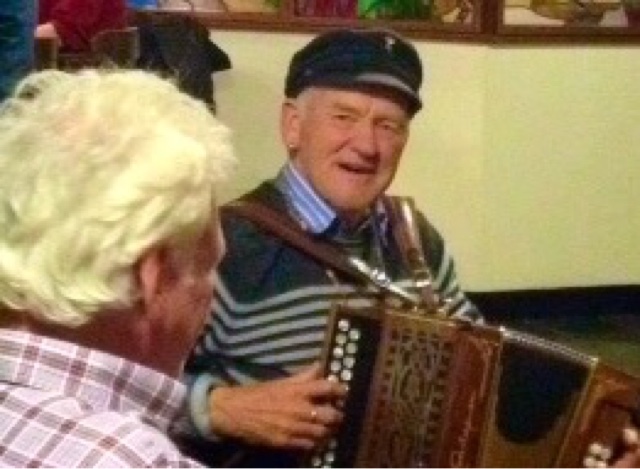 We listened to the King playing the accordion and a visitor from Meath pulled out his pipe and they played together, everyone sitting in a circle and tapping feet. In between he told stories about his father making poiten – a local grain alcohol – that could make you blind and bend your mind. And he talked about how the government wouldn’t provide a decent ferry to get visitors out to the island, and is unhappy that other parts of Donegal have gotten tourism help but not Tory. He takes his job of King very seriously, and keeps working to promote his home. 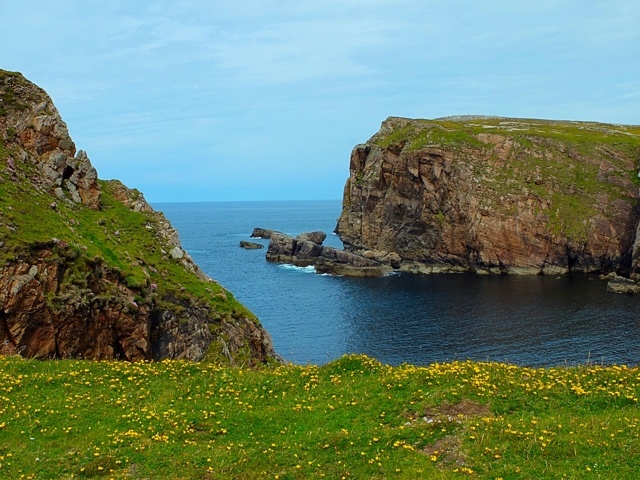 Visitors come to the island lured not only by the strong traditions here, but because this beautiful island has astounding bird life … gannets and puffins and pikes and is home one to strong colonies of several threatened seabirds. We walked for miles over every inch of the island climbing up the high bluffs on one side and walking out to the lighthouse on the other. The mossy bog covered rocky soils, small lakes and wetlands drew birds that nested and fed. Rabbit burrows pitted the bog, and rabbits were everywhere hopping around fearlessly … a fox would be in heaven here. And the island has also fostered an artist tradition … and several islanders exhibit around the world, including the King. The art has varied styles and personalities, but all involves the island or the see or the birds. Artists from around Europe come to the Island as a retreat. On the ferry out to the island I struck up a conversation with Rory who lives on the mainland but is from Tory Island and still has a house and keeps a boat here. He used to fish on a trawler, but there is no fishing anymore. His two children, he says with a grimace, are in England for work. He points out the islands and tells me how fishermen line up the landmarks to navigate. He asks me what I like best about Ireland so far. And I say the usual things – which are true … The people are so nice. The country is beautiful. And then I say how much I learned from my time in Northern Ireland … that as a child during the Troubles we didn’t have a TV and I just never really understood what it was like. That I feel like I learned a lot, and it was a very compelling few days in Belfast and Derry really trying to understand the things that were just pages in a history book before. Rory holds up one finger and says emphatically, “You be very careful. Talking about that is not always safe, in a pub where people are drunk … things are better and it’s calming down. But it’s not over.” He then moves back to talking about fishing and island life. Before we get off the boat he takes off his watch and he shows me the inscription on the side, saying, “this was a gift.” And the front has a small emblem with the Republican colors, and on the side is an engraving in Irish that refers to the struggle for freedom. And I just smile at him … I don’t ask what he did to be gifted that watch. Probably don’t want to know. And, I expect the code for not talking about the Troubles as the tensions slowly diminish is exactly because everybody has a story and some level of past involvement, and not talking about it means it continues to recede. The past is the past. And while I completely understand why the King wants to bring more people to his island, selfishly I hope they get enough visitors to keep the island populated and prosperous, but don’t become a touristy mess like so many other places. Because then I’m afraid this special place would lose the very things that makes it … special.